There are some alternative energy sources available to cope up the increased demand for electricity. These alternative energy resources are in existence for long. The non renewable energy resources are limited and produce greenhouse gases. The greenhouse gases adversely affect the environment which is the main reason for global warming. Hence, it is today’s demand to use alternative energy to handle energy crises issue. 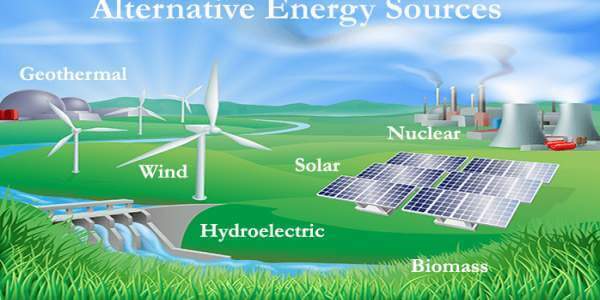 Alternative energy sources such as solar, wind, nuclear, hydropower are the clean energy sources. This natural energy sources don’t produce greenhouse gases and are environment-friendly. I have covered, solar energy and wind energy in detail at a below-mentioned article, hope you like to read it. If you like to know about the other renewable energy sources, below post will give you a glimpse of renewable energy sources. Among all other alternative energy sources, nuclear energy attracts more attention due to its high potential. In this informative post on alternative energy, you will get all the information about nuclear power. This guide includes the history of nuclear energy, uses of nuclear energy, how a nuclear reactor works, how to produce electricity using nuclear energy, advantages, and disadvantages of nuclear energy etc. The history of nuclear energy starts in 1789 when Martin Klaproth discovers Uranium. 100 years later in 1895 Wilhelm Röntgen accidentally discovers X-rays. In 1896 Becquerel uses uranium and radium to discover alpha and beta rays. Becquerel is known as the “father of nuclear energy”. Then after Villard discovers gamma rays. These alpha, beta and gamma rays are actually high-speed particles. Nowadays this nuclear radiation is known as alpha radiation, beta radiation, and gamma radiation. In between 1902-1919 Ernest Rutherford conducted various experiments with this alternative energy. Further in 1905 Einstein puts a theory relating mass and energy, E=mc2. This theory is known as Einstein Equation. In 1913 Bohr publishes a model of the atomic structure which is widely accepted till today. 1932 is the important year in the history of nuclear power as James Chadwick discovers the neutron. This is the important component in nuclear fission. In the year 1938 Otto Hahn and Fritz Strassman, proved that when the atoms are split, energy is in turn released. 1951 is the year when the first energy created by nuclear power. An Experimental Breeder Reactor I is set up in Idaho to do this work. The first nuclear power plant to produce electricity for a power grid is set up in 1954 by the USSR Government. Nuclear energy is the energy in the nucleus, or core, of an atom. Atoms are those tiny particles in the molecules that make up gases, liquids, and solids. There is a huge amount of power in an atoms dense nucleus. Atoms are made up of protons, neutrons, and electrons. In the nucleus of an atom, positive electrical charge protons and negative electrical charge neutrons are surrounded by electrons. Electrons do not have an electrical charge. A huge alternative energy is present in the bonds that hold the nucleus together. These bonds are broken by nuclear fission, and the energy released can be used to produce electricity. The nuclear energy can be produced in two ways; one is nuclear fusion and another one is nuclear fission. In nuclear fission, atoms are split apart, which releases energy. 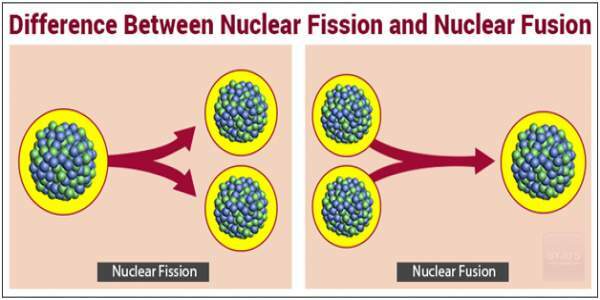 During nuclear fission, a neutron collides with a uranium atom and splits it. This action releases a large amount of energy in the form of heat and radiation. More neutrons are also released when a uranium atom splits. These neutrons continue to collide other uranium atoms, and the process repeats itself over and over again. This process is called a nuclear chain reaction. All nuclear power plant uses nuclear fission process to generate the heat. So, you can run the generator to produce electricity. In nuclear fusion, energy is released when atoms are combined or fused together to form a larger atom. Sun is the best example of the nuclear fusion process. Nuclear fusion is the subject of ongoing research as a source of energy for heat and electricity generation because of the difficulty in controlling a fusion reaction. Nuclear power is a form of energy which is created by splitting apart the nuclei of atoms. A nuclear power or in another word atomic power is the use of nuclear reactions that release nuclear energy. Initially, nuclear power is used to produce atom bombs. The worst example of nuclear power is first experienced when an American B-29 bomber dropped the world’s first deployed atomic bomb over the Japanese city of Hiroshima. After this, world leaders decided to use nuclear power for the peaceful purpose. Nowadays benefits of nuclear power are counted in Ships and Submarines, Medical Science, food, and agriculture etc. The greatest use of Nuclear Power today is to produce electricity by nuclear fission process in a nuclear power plant. Nuclear energy, the best form of alternative energy, if used properly, is the blessing to the humankind. After the Second World War, a vast research is carried out in nuclear engineering. Today nuclear energy is mostly used to generate electricity in a nuclear power plant. Actually, nuclear power plant works same as the thermal power plant works. Instated of using nonrenewable energy resources such as coal or gas, the nuclear power plant uses nuclear fuel to generate the heat energy. Almost all nuclear power plants in the world are using nuclear fission process to unlock the energy in the nuclei of an atom. 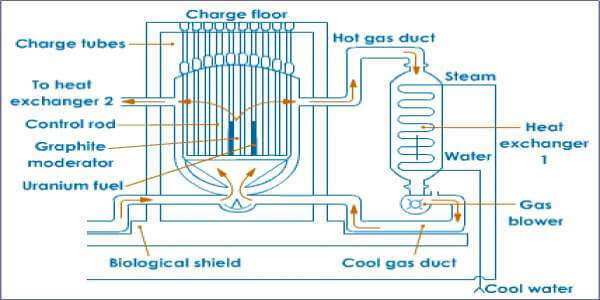 A nuclear reactor is used to carry out nuclear fission process. 90% of a nuclear fission reactor in the world is light water reactor which generates electricity very efficiently. From all types of nuclear reactors, the Nuclear Pressurized Water Reactor (PWT) and the Boiling Water Nuclear Reactor (BWR) are widely used worldwide. How is electricity generated in a nuclear power plant? In a nuclear reactor, nuclear fission of nuclear fuel such as Uranium or Thorium is carried out. This nuclear fission process generates heat energy. This produced heat is used to boil the water. So, the water is transformed into steam. The high-pressure steam exits in the containment building used to rotate the steam turbine. At this moment, part of the steam energy is being transformed into kinetic energy. 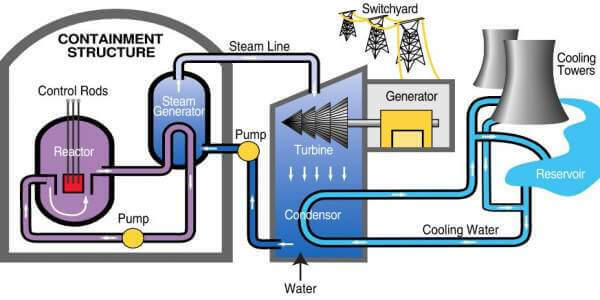 A steam turbine is connected to an electric generator whereby the kinetic energy is transformed into electric energy. The steam goes out of the turbine is redirected to a condensation chamber. So, it cools down by contact with pipelines of cold water. As steam transformed into water, using a pump, water is sent back again to the nuclear reactor. Hence the cycle will be repeated again. Okay, till now you have the information that nuclear power can be used as alternative energy. How will you capture this sustainable energy for a useful purpose? A nuclear reactor will help you in this. So, let’s see how a nuclear reactor works. A giant concrete dome is constructed to work nuclear reactor in a safe manner. First, nuclear fuel, uranium is loaded up into the reactor. In the heart of the reactor, atoms split apart and release heat energy. This produces neutrons and splitting other atoms in a carefully controlled nuclear reaction. Control rods made of materials such as cadmium and boron can be raised or lowered into the reactor. This will soak up neutrons and slow down or speed up the chain reaction. Water is pumped through the reactor to collect the heat energy that the chain reaction produces. It constantly flows around a closed loop linking the reactor with a heat exchanger. Inside the heat exchanger, the water from the reactor gives up its energy to cooling water flowing in another closed loop, turning it into steam. The steam from the heat exchanger is piped to a turbine. A spinning turbine is connected to an electricity generator. The generator produces electricity that flows out to the power grid. Like every other energy source, nuclear energy has both good aspects and bad. Hence, Nuclear Power is perhaps the most passionately debated. There are safe ways to dispose of nuclear waste and reactor safety. So, the environmental impacts of nuclear energy can be reduced considerably. Next-generation reactors designs exist that can reduce waste, improve safety, and reduce costs. Nuclear energy by far has the lowest impact on the environment since it does not release any harmful gases. There is no adverse effect on water, land or any habitats due to the use of it. Nuclear energy is very powerful and efficient than other alternative energy sources. Nuclear Power Plants have very high load factors in excess of 80%. Almost 24X7 days electricity production is possible with nuclear energy. Nuclear power can be produced even in the cases of rough weather conditions. This is impossible in other renewable energy sources like solar or wind which require sun or wind to produce electricity. Only about 28 gram of uranium releases as much energy as produced from 100 metric tons of coal. Hence comparing to other traditional fuel the cost of nuclear fuel is very less. It requires a little amount of uranium to produce energy. So, the handling and transportation of nuclear fuel are easy comparing to coal or gas. If nuclear energy is used to produce nuclear weapons or nuclear bombs, it can be a disaster for humankind. We had experienced this during the Second World War after the nuclear bombs were dropped on Hiroshima and Nagasaki. Despite so many new technologies, there is always a possibility of uncontrolled nuclear fission in a nuclear reactor. We have experienced it at Chernobyl or more recently Fukushima. The risk associated with nuclear energy is relatively high. Radioactive waste emits radiations from tens to hundreds of years. Hence safe disposal is a headache for all countries, which is using nuclear energy. The safe storage of radioactive waste has been a major hurdle for the expansion of nuclear programs. This radioactive waste can be used to make nuclear weapons also. When using nuclear energy for electricity production, it needs a lot of investment to set up a nuclear power station. This is not always possible for the developing countries to afford such a costly source of alternative energy. Unlike other non renewable energy resources which are available to most of the countries, nuclear fuel, uranium is existing in only a few of the countries. Most of the countries have to rely on other countries for the constant supply of this fuel. Considering the limited availability of nuclear fuel, will you think, is nuclear energy renewable? Put your thoughts in comments.